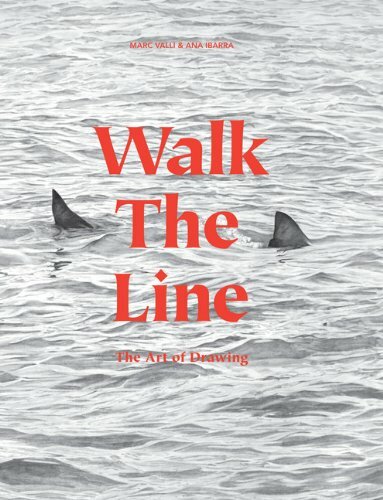 Walk the Line: The Art of Drawing is a delightful collection of artworks that celebrate traditional drawing. This is a thick 320-page hardcover authored by Ana Ibarra and Marc Valli. The cover is those cardboard cut off at the sides, and the pages are off white, non glossy. The work curated and showcased are outstanding. Well, there are 66 artists so you get to see a huge variety of work. The media used are mainly pencils, graphite, charcoal, ballpoint and ink. These artists are masters of the tools they use. It's quite amazing what effects the tools can produce, such as realistic fur drawings with pencils, the textures created by ballpoint pen hatching. The illustrations are really beautiful, detailed. It's difficult for me to pick any particular artist or piece and say that's my favourite. Every artwork is unique and has their own charm, some alluring element. All are inspiring to look at, be it portraiture, pattern designs, animals or scenes from imagination. Each artist also has a short profile talking about their background, techniques, style and other stuff. Highly recommended to those who like contemporary art and illustration in traditional medium.